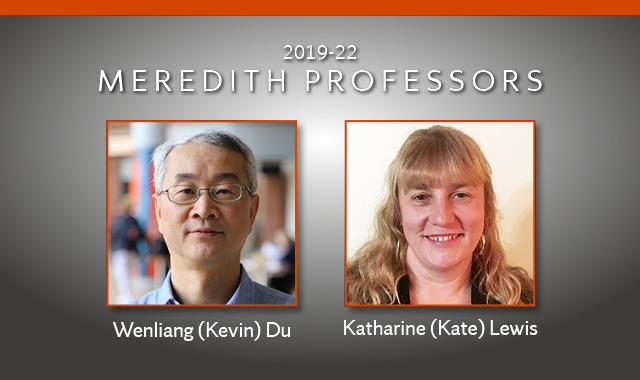 Wenliang (Kevin) Du, professor of electrical engineering and computer science in the College of Engineering and Computer Science, and Katharine (Kate) Lewis, professor of biology in the College of Arts and Sciences, have been named the 2019-22 Laura J. and L. Douglas Meredith Professors for Teaching Excellence. They will be honored at the One University Awards Ceremony on Friday, April 12, at 4 p.m. in Hendricks Chapel. A substantial bequest from the estate of L. Douglas Meredith, a 1926 graduate of the College of Arts and Sciences, allowed for the creation of the Laura J. and L. Douglas Meredith Professorships in 1995 to recognize and reward outstanding teaching at the University. The awards encourage faculty members to look upon the many dimensions of teaching as manifold opportunities for constant improvement, to emphasize the great importance the University places on teaching and to improve the teaching and learning process on campus. The Meredith Professors receive a supplemental salary award and additional funding for each year of their appointment. The Meredith Professors are enrolled for life in the Meredith Symposium as an honor and to provide a permanent forum for the discussion of teaching and learning. Kevin Du, a longtime faculty member in the College of Engineering and Computer Science, consistently works to provide his students with creative, hands-on, experiential learning experience with real-world applications. Du has been a member of the Syracuse University community since 2001. His research areas are in system security and cybersecurity education, and he teaches courses in computer security, network security, internet security and Android programming. Du used $1.3 million in grants from the National Science Foundation to develop the SEED (SEcurity EDucation) labs. Through SEED, he developed hands-on laboratory exercises for computer and information security education that are now used by more than 1,000 educational institutions worldwide. Yun Wang, associate professor of computer and information systems at Bradley University, attended one of the four-day SEED workshops that Du held at Syracuse University last summer. “There is a famous Chinese proverb that fits the security education very well: ‘Tell me and I forget. Show me and I remember. Involve me and I understand,’” she says. “Dr. Du did a fantastic job in involving educators, students and professionals to learn the principles of computer security and apply knowledge in solving real-world problems. I cannot express my sincere gratitude enough for his dedication and contribution to teaching and learning the cutting-edge and ever-changing security topics in education and profession.” About 110 faculty members are expected to attend Du’s SEED workshop at Syracuse University this summer. Du is author of “Computer Security: A Hands-on Approach” (CreateSpace, 2017), an influential book in the field that has been adopted by 80 colleges and universities. Du consistently receives very high course evaluations from his students. “When I first took Dr. Du’s class three years ago at Syracuse University, his extensive knowledge of computer and network security was immediately apparent,” one student said in his evaluation. “With his passion for teaching and creativity, he seamlessly integrated himself into the class and effortlessly guided the students into the computer security wonderland.” Another lauded Du’s use of playing cards, pictures, news links, movie clips and projects to help students relate more to various concepts that were discussed in class and to make even the most complicated subjects understandable. Du’s Meredith Professor project, “Building Simulators for Cybersecurity Education,” is aimed at providing students with hands-on experience with cyber attacks and defense without causing real-world damage or violating the law. Inspired by the flight simulator located in the College of Engineering and Computer Science, he will build on the SEED labs to create hands-on labs for situations involving large numbers of computers. He plans to develop internet and Bitcoin simulators and lab exercises that simulate real-world activities such as transactions and attacks. Du will develop course projects that are diverse, inclusive, feasible and sustainable to help other interested faculty incorporate these simulators into their courses. Kate Lewis says she is a firm believer in the transformative power of education. Lewis, a member of the Syracuse University community since 2010, is director of the Integrated Learning Major in Neuroscience and faculty co-director of the Women in Science and Engineering (WiSE) program. She teaches courses in biology, neuroscience and undergraduate research in biology. Recently, she established a journal club for biology faculty on high-impact teaching practices, and she has collaborated with colleagues to develop new WiSE initiatives. While at Syracuse University, she has also taught/mentored 25 undergraduate students and three postgraduate interns undertaking individual research projects in her lab. In all of her classes and one-on-one work with undergraduate and graduate students, Lewis’ goals are to encourage critical thinking and enable students to develop the skills and agency needed to be effective citizens in the world. For her proposed Meredith Project, Lewis plans to use exam wrappers as a means to facilitate student development of metacognitive/self-reflection skills for maximizing effective studying and learning. All of the resources that she develops will be placed online where they can be easily accessed. She will also develop a workshop on how metacognitive wrappers and similar reflective exercises can be used to self-assess and improve learning for the WiSE undergraduate women of color group. Sandra Hewett, the Beverly Petterson Bishop Professor of Neuroscience and professor of biology, says Lewis’ project is poised to make a big impact on student success.